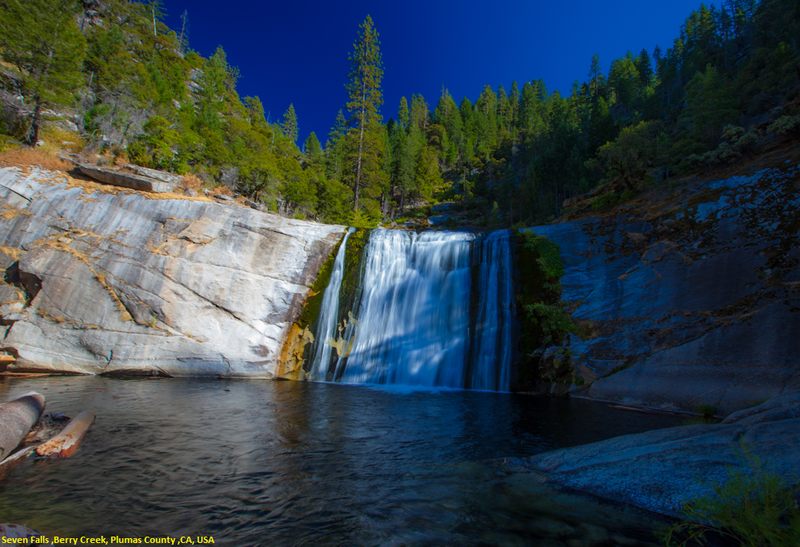 Seven Falls, aka South Branch Falls, consists of a series of seven spectacular waterfalls along the South Branch Middle Fork of the Feather River, in Plumas National Forest. Each of the drops is at least 40 ft. high along a raging river in a narrow, steep, secluded canyon. The total height of all the waterfalls from highest to lowest point is around 600 ft. Getting to the waterfalls is difficult to say the least, and involves much scrambling along steep cliffs. To get to this magnificent waterfalls, take Highway #162, head east for 6.7 miles to Forbestown Road. Take the Lumpkin Road by turning right and after some 6.3 miles turn left and drive 12.3 miles until you reach Forest Road 27 on your right. Continue for 7.3 miles on Road 27. When you reach the junction at Road 94, go straight at junction to Road 94 until you reach another junction after 6.8 miles. Turn left on Road 94 for another 2.8 miles, and when you see a signed dirt road on the left, go for it. You are now on Road 62 towards another junction about less than half a mile. Take the left turn and drive exactly 2 miles from that junction and you will reach to an unsigned trailhead. You can park on either side of the road where there are large clearings. From the road, you can now hear the cascading waterfall. Ahead is a 2.4-mile long dirt road, which is rough, but can be driven with a car.Along the Milsap Bar Road, you should watch for the trailhead for it is unmarked and not easy to follow. But once you start on it, you will notice that it is quite clear and easy to follow. It would be a short but steep trail towards the river. Your excitement and anticipation will double as you hear the waterfalls gets louder and louder as you get closer and closer to the river. The trail finally emerges at the base of the Fourth Fall by the river, which is right on top of the Fifth Fall.